Following his involvement in a tragic highway accident, a career truck driver spirals into depression. Camion is a film written and directed and edited by Rafaël Ouellet. It premiered in competition at the 2012 Karlovy Vary International Film Festival, where it won the prize for Best Director in addition to the Award of the Ecumenical Jury. Another fine example of low-key drama from the province of Quebec. This tells the story of Germain (Julien Poulin, in a terrific performance), a lifelong trucker (camion is the French word for truck) who gets a severe case of PTSD after a young woman dies in an accident with his truck. Even though it was entirely her fault, he is overcome with guilt, and begins to spiral into a deep depression. Worried about his father's condition, Sam (Patrice Dubois), an unambitious thirty-something working as an overnight janitor in downtown Montreal, seeks out his older brother Alain (Stephane Breton), a struggling writer who spends more time drinking and chasing women than anything else, living in a cheap motel room in New Brunswick. Together they trek to their hometown in rural Quebec to check on Germain. Though not entirely autobiographical (the director had originally intended to make a documentary about his own father who is a truck driver, but decided to turn it into a drama instead), there is still the immediate sense that Ouellet is deeply familiar with these characters and their small town roots. Granted, this type of family-coming-together-after-a-traumatic-moment story, isn't exactly original, but its absorbing, the way all three of these ordinary men are developed with great detail, nothing extravagant, just simple little things, words spoken or left unsaid, that add up to give a clear and genuine picture of where they are from, who they are, and what they mean to each other. Acting is solid all around, but Poulin is the main attraction. The subtle way he expresses his character's profound sadness and despair is emotionally riveting. It's really an amazing understated performance, and he also has the perfect rugged look to match. He should be a lock for Genie and Jutra awards consideration. It may sound a bit too slow and gloomy for everyone's taste, but there's a good bit of humor and beauty as well. The interaction and chemistry between the two brothers is frequently amusing, whether bickering over musical tastes, or competing over video games. While the predominately still framed cinematography takes the boring small town milieu and gives it a widescreen cinematic appeal. It's authentically cold and grey, but all all the nuances are captured on screen to evoke a certain feeling of elegance and nostalgia. It's a film that stays quiet, and aside from the very well staged accident at the beginning, doesn't offer any blatant dramatic or emotional revelations. The journey is made up of simple restrained moments, but ones that add up to form a complete and poignant slice of life. Highly recommended. Poulin is capable of great drama and funny bits too. He is lucky to be able to do something else than his mega hit Elvis Gratton. 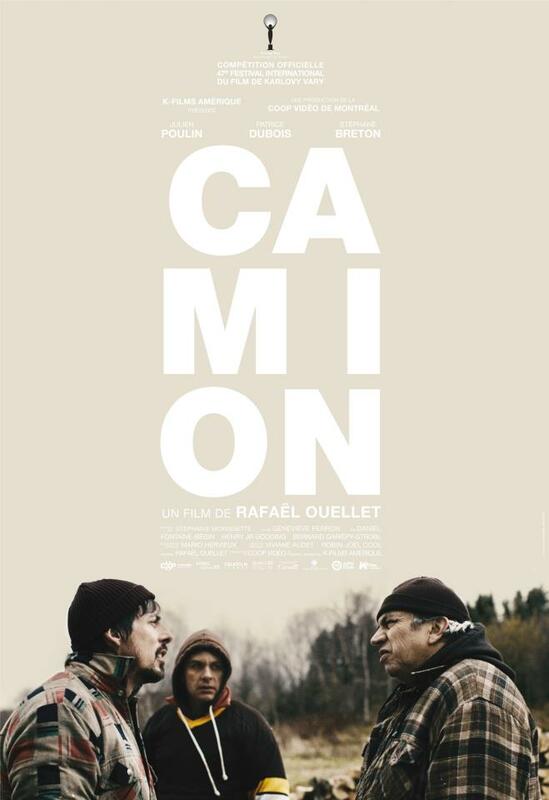 Camion is one of the films I have to see from this year. I really don't think it'll be a favorite, but I look forward to it. I'm actually not familiar with that role of his. Is it something I should check out? Do give it a look if it comes around. I'd be interested in your take on it.